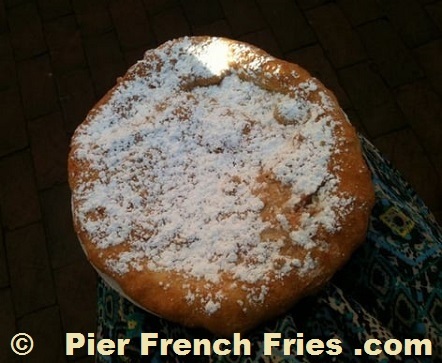 French Fries - Fried Dough - Hot Tasty Treats - Cold Drinks - and More! - Our world famous, fresh cut French fries are the staple of our menu. The potatoes that we use are premium locally grown here in New England and delivered to us straight from the farm. They are washed, peeled and cut daily right in our facility. Always 100% gluten free and cooked in high end soybean oil, you can order one of three sizes; a cup, pint, or box. We offer a number of different condiments here at Pier Fries. Ketchup, vinegar and salt are, of course, the most popular. However, hot nacho cheese, chili and gravy provide further options to our customers. For the "French Canadian" in you, it's hard to resist our ever popular Poutine (French fries topped with real cheddar cheese curds and hot beef gravy) that rounds out our French fry offerings. - To complement our world-famous fries, we offer a variety of other tasty snacks from a separate fryer. These beach side fun foods include chicken tenders, mozzarella sticks, and beer battered onion rings. Our fried dough, which has been a customer favorite for years, is sure to satisfy your sweet tooth. We offer a variety of toppings such as butter, powdered sugar, cinnamon, spiced apple, strawberries, blueberries, and Bavarian crème, all at no additional charge. Should you crave an irresistible steamed hot dog, we have you covered there too. - Need to cool your thirst from our hot tasty menu? 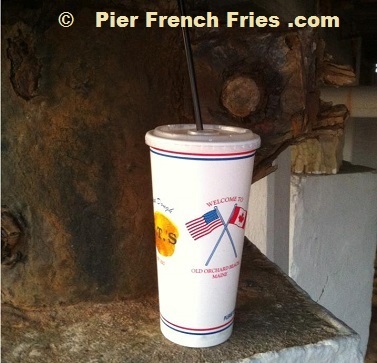 Pier fries offers Pepsi® products from the bottle or from the fountain. Our carbonated flavors include Pepsi®, Diet Pepsi®, Sierra Mist®, Mountain Dew®, Dr. Pepper®, Orange Crush, and Mug Root Beer. We also offer Gatorade® in various flavors, Brisk Iced Tea, and bottled water to conclude our non-carbonated drinks. 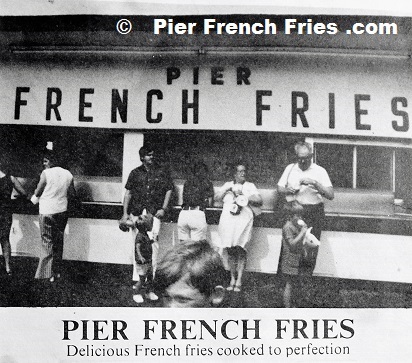 In 1932, Old Orchard Beach was introduced to the French Fry. 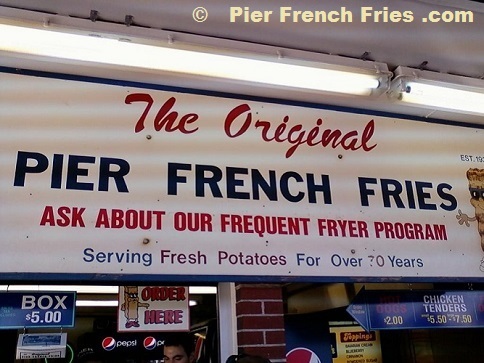 The legend of Pier Fries still lives on. 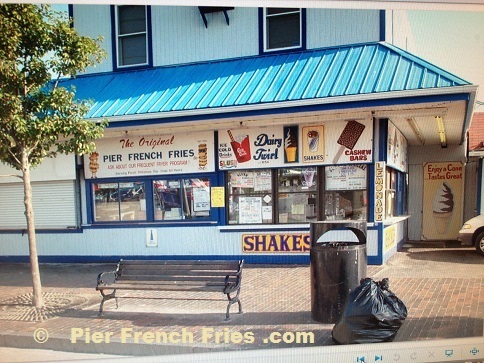 Pier French Fries originated on the famous Pier in Old Orchard Beach. For 37 years this is where the family-owned business made its home. 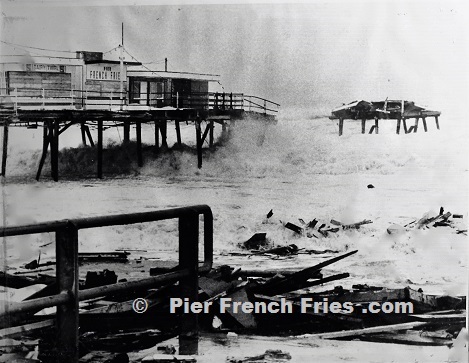 Then, in 1969, a horrific fire destroyed most of the structure, including Pier Fries. The business rebuilt and remained there for nine more years. Until once again, a tragic event occurred. This time the “Blizzard of 1978,” necessitated a move off the Pier for good. After being located in the downtown square for 24 more years, the business made its final move to the infamous Whitehall Building, where it resides today. What has made this business so special, and a MUST for vacationers and locals alike is the same thing that makes it so special today. Using the highest quality potatoes…and the highest quality of oil (used to cook the product)…right down to the very best condiments and toppings (for the patrons to add to their order), very little has changed in the process that has created a recipe for success. 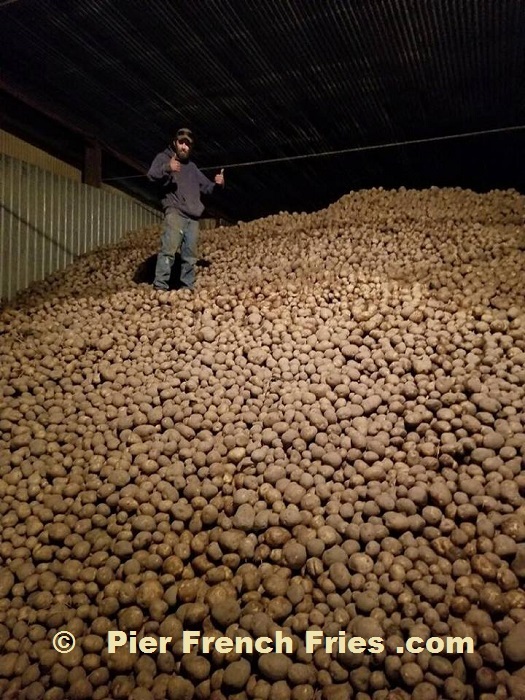 Each potato is still hand cut every day. After all, who could turn down a fry with a perfectly crisp outer layer, coupled with a soft and moist interior that simply melts in your mouth. This…is a Pier French Fry. So many relatives and locals have been employed there serving, just as it does today, three choices of fries; the cup, the pint or “the ever popular”, box. One of the most popular comments made over the years by customers has been, "I ordered the cup and should have ordered the pint… because all I did was go back and buy another cup." It truly is something you cannot get enough of! 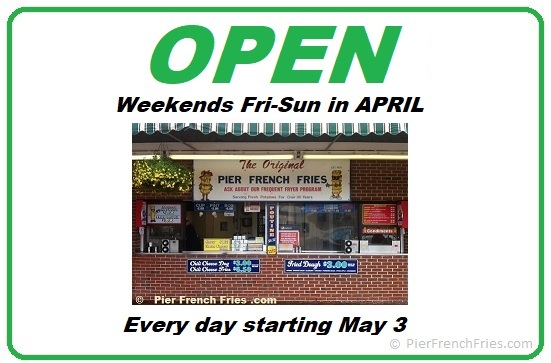 We invite you, during your visit to Old Orchard Beach, Maine, to come visit us at Pier French Fries. As the years have gone by, we have increased our menu to include such things as Poutine (French fries, cheese curds and hot beef gravy) hand-tossed fried dough and onion rings just to name a few. 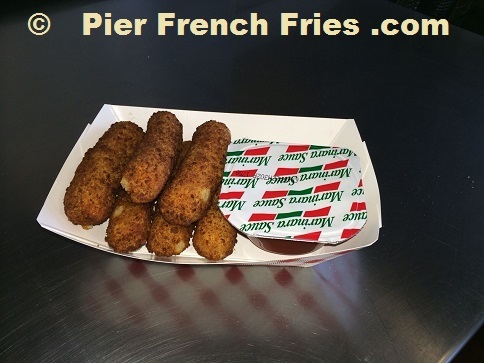 It is our hope that you will have a memorable experience with us and become a loyal fan of Pier Fries, just like the thousands who have visited us before you. 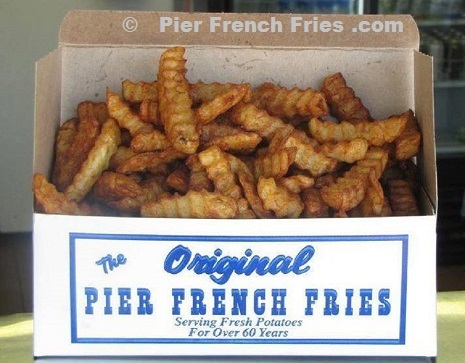 "Any stop at OOB is not complete without a box of pier fries. Always a crowd near the counter but the wait is usually only a few minutes. Look forward to these fries all year long." "Went last weekend and got some fries. They were just how I remember them. Fresh and hot. Very tasty. I put a lot of salt and vinegar on them. Perfect! I love these fries! They are the perfect beach french fry in my opinion." "French fries are not easy and these are the best you will find. I have been eating these since I was a kid and they are perfection in a potato. Krinkle cut, cruncy on the outside with a rich potato flavor inside. Make a special stop for the fries or by all means grab some when you are at the beach. " 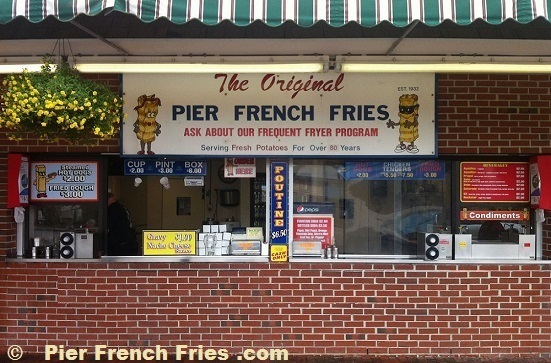 "A summer is not complete with a trip to OOB for some pier fries! The man and I have been known to make the 30 minute or so drive from my mother's house and put $1 in a parking meter, just to indulge in the heaven that is these fries! "